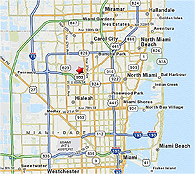 Miami-Opa locka Executive Airport (OPF) is located only 10 minutes from Hard Rock Stadium (home of the Miami Dolphins) and 35 minutes from Marlins Park (home of the Florida Marlins), 35 minutes from Downtown Miami, 30 minutes from Miami Beach and only 20 minutes from Miami International Airport. Designated as a reliever to Miami International Airport, Miami-Opa locka Executive Airport features no landing fees and quick and easy access. The airport offers full FBO service, a wide range of aircraft repair and maintenance services, including airframe, power plant and avionics repair, and US Custom Service on the airfield. The airport is also home to the busiest U.S. Coast Guard Air/Sea Rescue Station.